Irish car decal features the coat of arms for County Waterford, Ireland. 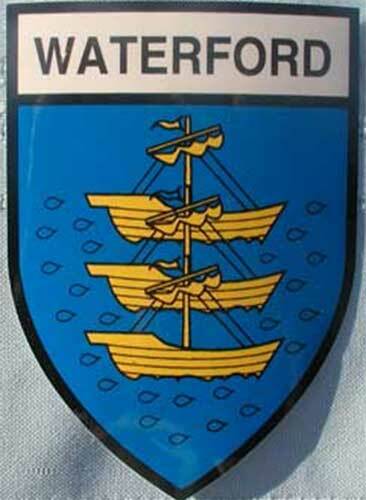 County Waterford sticker is a shield shaped decal that features an adhesive back which is exposed when you remove the backing paper. The County Waterford coat of arms is featured on this Irish decal which is suitable for display on your car or any flat surface. The Waterford sticker is a full color decal that measures 3" wide x 4" tall. The Irish car decal is made in Ireland, and it is available at The Irish Gift House. Irish decal features the coat of arms for Ireland's four provinces on a metallic finish shield shape design with shamrocks in the center. Irish decal is an oval design that features IRL along with the Irish flag and ERIE. Irish decal is a metallic oval design that features IRL along with the Irish flag and Ireland's four provinces. IRL decal features a black and white oval design. Irish decal is an Euro style oval design that features crossed US and Irish flags.